I intended making a repeat recipe from my blog (chicken scaloppine with wine sauce) but the store was out of chicken thighs so I bought chicken breasts – which I never buy because I don’t know how to cook it. Then I recalled this amazing recipe from dianeskitchentable and went on to create my own stuffed chicken version with ingredients I had at home. Have 2 large organic chicken breasts, about 1.5 pounds total. Cut each breast in half. Then cut each half into the side so that it flaps open. In a large skillet heat 1 teaspoon oil to MEDIUM and saute onion until soft, 3 to 4 minutes. Reduce heat to LOW, add another teaspoon oil and stir fry garlic until it begins to brown slightly, 1 to 2 minutes. 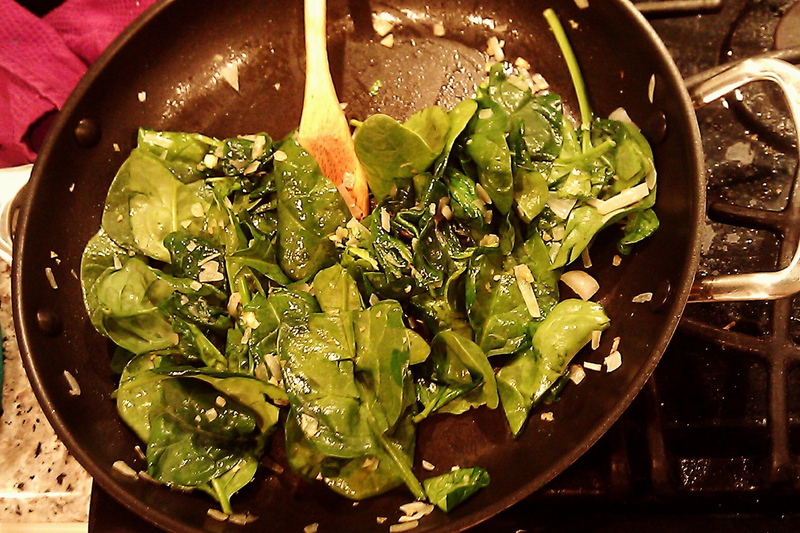 Increase heat back to MEDIUM, add spinach and basil, saute until spinach wilts just so. 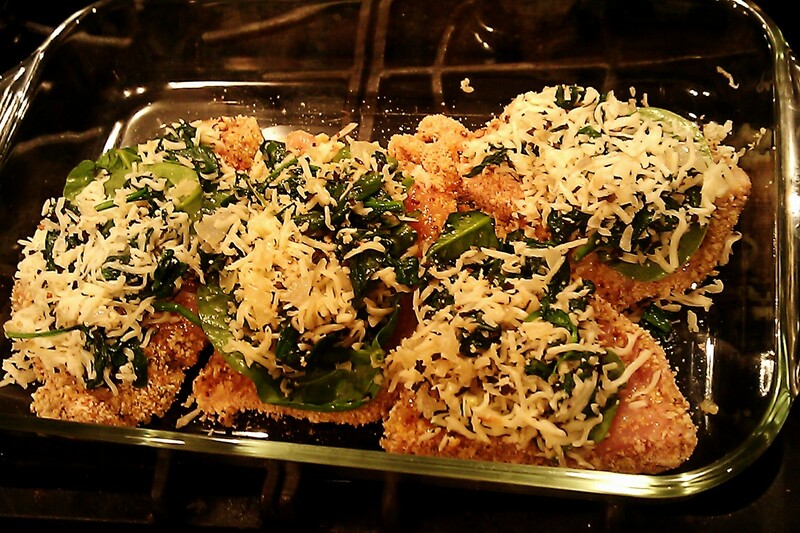 Place spinach saute into a mixing bowl – let it cool a bit – then mix in the mozzarella cheese. In a medium bowl combine breadcrumbs, seasoning, garlic and salt. Completely coat chicken pieces in the egg batter. 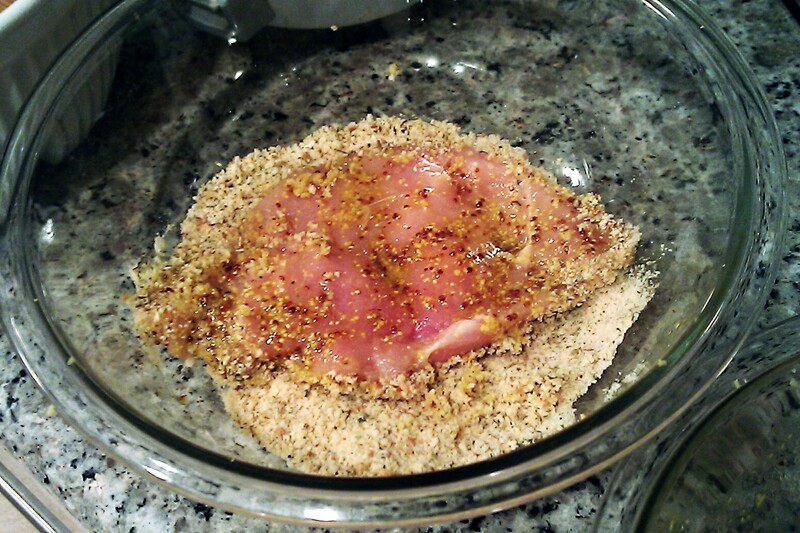 Then coat only the top of the chicken with the breadcrumb mixture. Place chicken crumb side down on a baking dish. Divide the spinach mixture on top of each chicken. 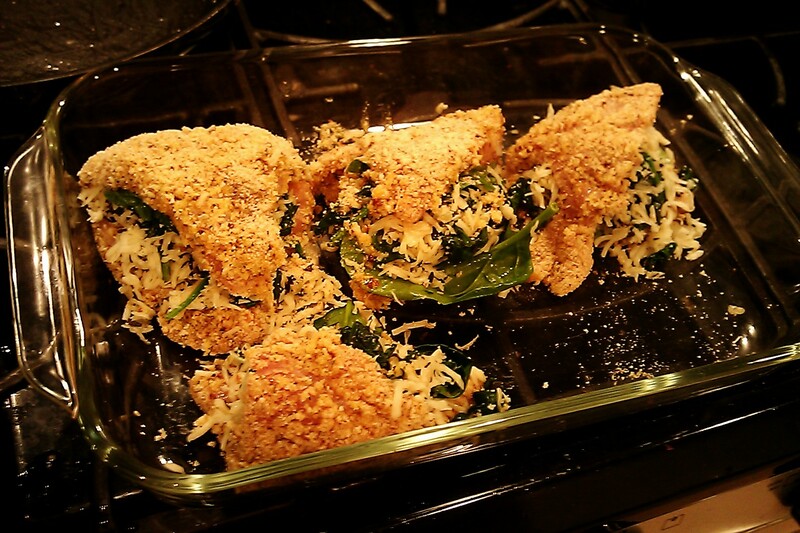 Carefully fold each chicken piece over the spinach. Bake on center rack 35 to 40 minutes. In a large skillet heat medium-high the broth, wine and butter. Bring to a simmering boil and reduce 8 minutes. Add the lemon juice and reduce another 2 minutes. Serve chicken with the wine sauce spooned around it. That one looks like a keeper, for sure. And so easy! Super easy and delicious they’ll think you toiled all afternoon. 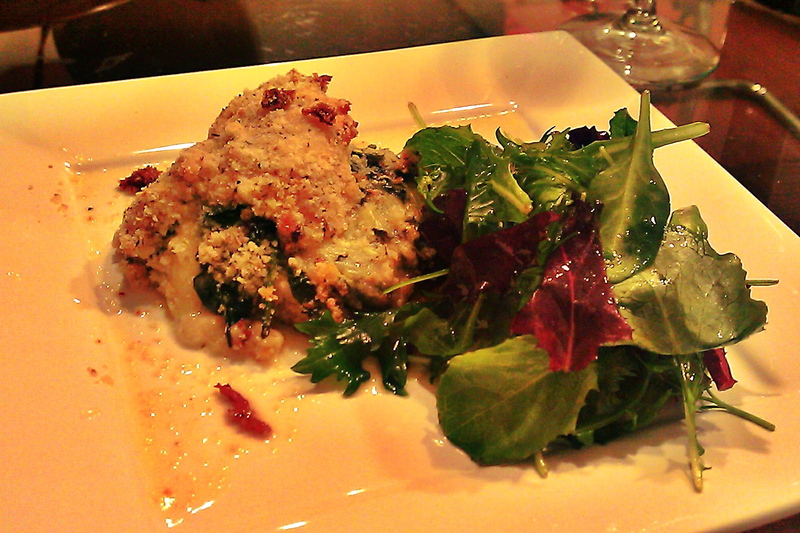 What a wonderful way to prepare chicken and spinach. I love it!! Thanks! It was delicious, will definitely be a repeat recipe. I don’t just like this – I LOVE IT! You just solved another “what am I going to do for dinner” problem because I was going to make the prosciutto wrapped chicken but would have to go out in the bitter cold for the prosciutto. As it turns out, I have all these ingredients AND my husband loves anything w/Dijon mustard so we have a winner. Thank you! Sweet! I have that problem almost every night – What’s for dinner? Since that last recipe, I think I’ll try a few more chicken breast dishes. It’s awesome to find a recipe that solves dinner and it’s not from a cookbook but from someone’s home cooking. I think that’s pretty neat. Salud! I always keep chicken breasts in the freezer and your recipe sounds like a “must try”. thanks, I was very pleased with the outcome. it’s definitely a “make-again” recipe. Please do. It was good!